You know The Tent Article, don’t know? 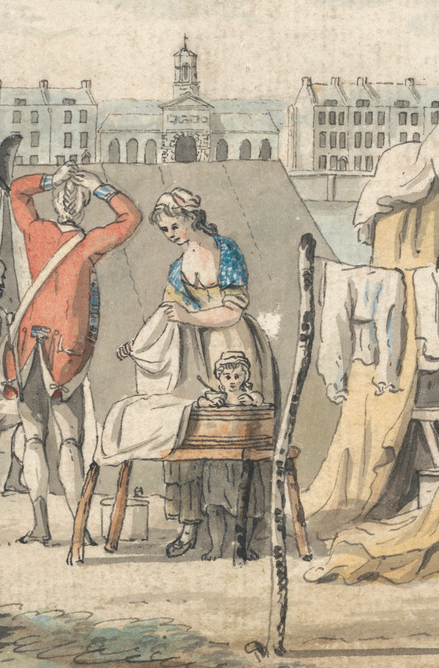 You do, if you’re camping 18th century private soldier style in your hand-sewn coat. 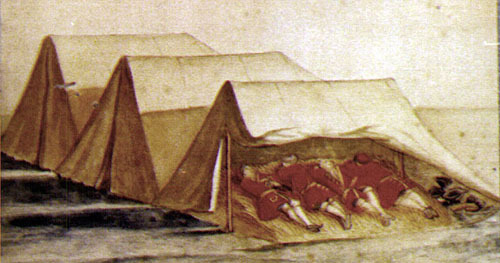 The Tent Article (hereafter The Document) pulls together documentation and research assembled by a team of living history enthusiasts dedicated to replicating the 18th century enlisted army experience in an accurate manner. Though the PowerPoint format affects the overall length, be warned: we are talking 300+ pages here. No strangers to the pursuit of the accurate and never ones to shy away from an arduous task involving pointy objects and string, the 10th Mass assembled on Saturday afternoon for a round of tent sewing. I first read The Tent Article in 2012, and was promptly ashamed of our hand-me-down tent which had everything to recommend it in terms of price, but wanted in terms of accuracy. 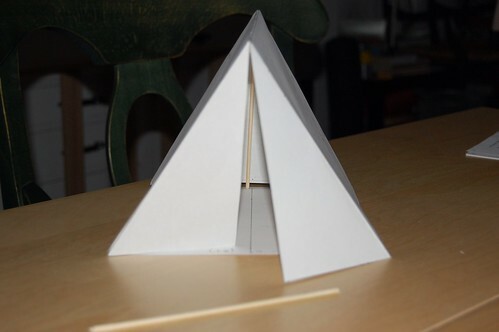 In response, I began making 1/8″ scale models of tents to figure out how much linen I would need to buy in order to make a truly correct tent. Finally, all that edumacation in art and architecture had utility! 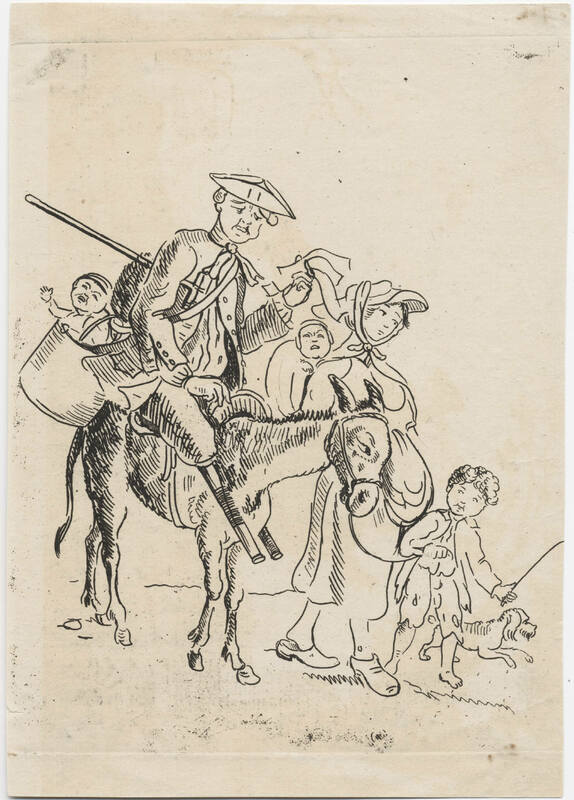 Alas: distractions arose, cost overwhelmed, our then-primary regiment scoffed, and I abandoned hand-sewn tent plans. Fast forward to Tyler Putnam’s blogging on The First Oval Office project, and I was once again intrigued. I began calculating how much vacation time I might need to complete a tent by hand in our living room. Well, thank goodness for finding fellow travelers, because lo and behold! 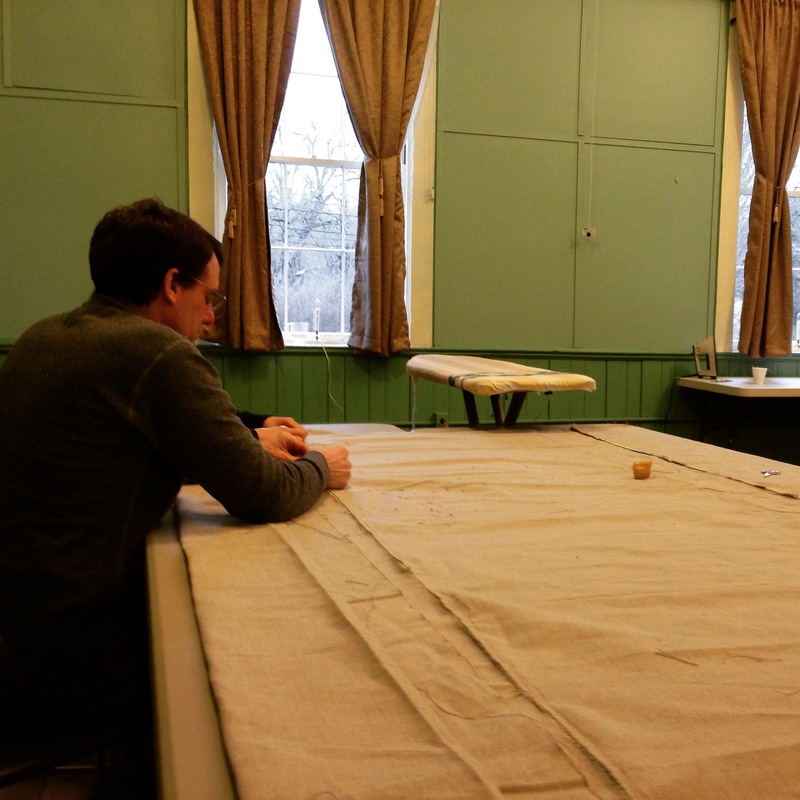 The 10th Mass had tents in want of sewing, so I could learn a great deal without filling our home with excessive yardage. 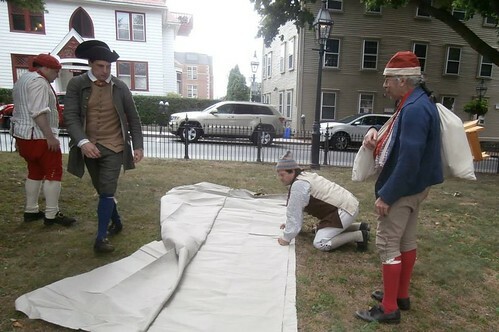 Progress was made last August in Newport, where the tents masqueraded as sails, but the canvas languished unsewn until last Saturday, when we duly assembled in Hopkinton and unfurled the vast expanse of linen. It was suggested that I might know some people with access to sail lofts (! 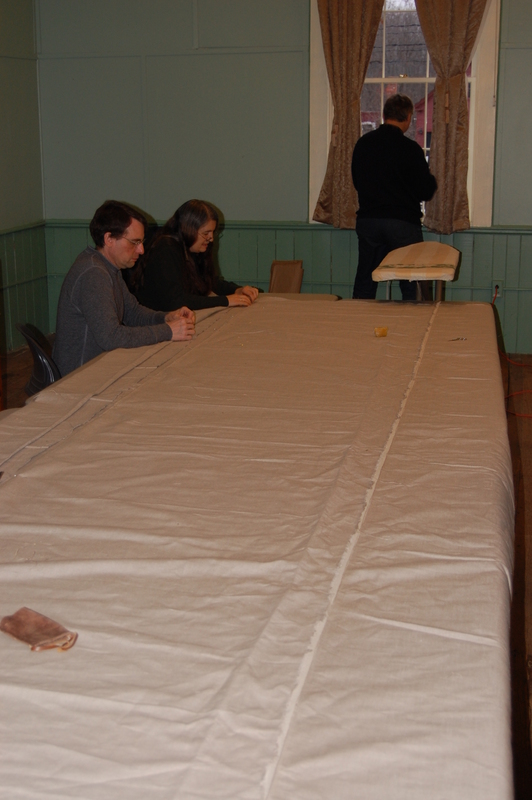 ), but in about 4 hours, a number of us managed to finish the final foot of backstitching and to flat-fell a little more than 60 feet of tent seams. It’s a vast expanse of linen. The Document was consulted to make sure we were proceeding correctly, though the iPad misbehaved and forwarded us many pages to grommets. (I’m looking forward to those, as I enjoy sewing eyelets– and have just earned myself the dubious honor of sewing at least half of them, I’m sure.) We checked the images, threaded our needles, and off we went. A few inches (feet) of felling had to be unstitched and resewn, but heavy linen is wily and some stitchers were newer to the process than others. But by the close of day, all seams were felled, needles packed, and tentage folded. Next up, per The Document, are mud flaps. This should get interesting, as math in front of an audience usually is. I promised a pun, so here’s the worst. Somehow we got on to unfortunate reenactorisms, which collided with Star Wars, and brought us to the realization that what we needed were light sabres… ’cause it’s the 10th Massachusetts Regiment Light Infantry Company. We were punished for this hilarity by having to drive home on untreated roads into snow that looked like we were trying to take the Millenium Falcon to hyperspeed. *It really happened on Saturday.